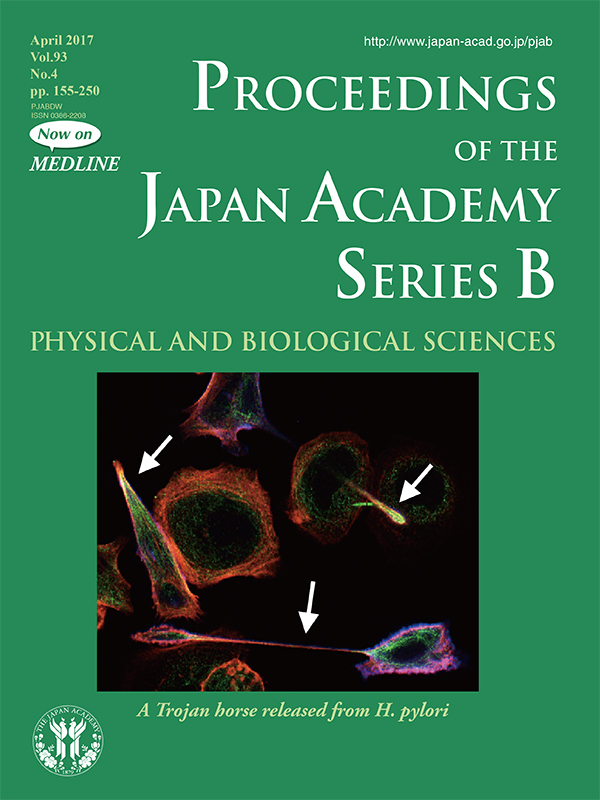 The cover illustration is from the article of Hatakeyama, pp. 196-219 of this issue. Since its discovery, clinico-epidemiological studies as well as animal infection studies have shown a close relationship between H. pylori infection and the development of gastric cancer, although underlying mechanisms remained unknown. A research group led by Hatakeyama, focused on the H. pylori effector protein CagA, which is directly injected into gastric epithelial cells via bacterial type IV secretion, in gastric carcinogenesis. Hatakeyama and colleagues found that, upon delivery into gastric epithelial cells, CagA interacts with and thereby aberrantly activates the pro-oncogenic protein tyrosine phosphatase SHP2, providing the first molecular link between H. pylori and gastric carcinogenesis. 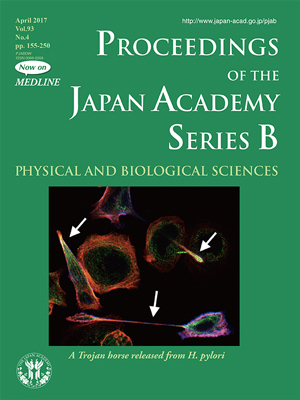 The image on the cover page shows an extremely elongated shape of gastric epithelial cells termed the “hummingbird” phenotype (white arrows), which is induced by CagA-deregulated SHP2. They also found that the CagA protein of H. pylori circulating in East Asian countries including Japan binds and deregulates SHP2 far more strongly than the CagA protein of H. pylori circulating in the rest of the world, which may explain at least partly the high incidence of gastric cancer in East Asia. They confirmed the oncogenic potential of H. pylori CagA by generating transgenic mice systemically expressing the bacterial protein, and they determined the three-dimensional structure of CagA underlying its pro-oncogenic scaffold function. Additionally, they uncovered roles of H. pylori CagA in perturbing cell polarity and in reprogramming cell fate, which may further contribute to the development of gastric cancer. A series of these works has shed light on the molecular mechanisms underlying H. pylori-mediated gastric carcinogenesis, the first identified bacterial carcinogenesis.